Hello and welcome to the Closets & Nooks Portion of Roomspiration! I’m so glad you are here and I can’t wait to look at all the fun stuff that you will share today! Today I’m going to share my new Cloffice with you that I just completed last tonight. I shared my first cloffice on my blog back in January of this year. We recently moved and I was missing my old Cloffice for all the papers, bills and stuff that didn’t have a home anymore. I found it a temparory home in the kitchen but I didn’t find this very attractive to look at or helpful when looking for a missing receipt. I knew right away that a cloffice was in our future and I had the perfect place for it, the front closet. After a bit of convincing, the hubby agreed we could turn the closet into a cloffice. Let the fun begin! The only obstacle was finding somewhere for our games and vacuums, guests to hang their coats when visiting our home. 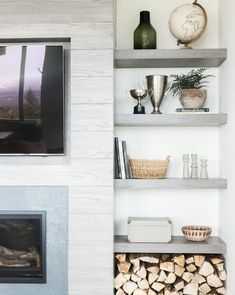 We completed the entryway a few weeks ago and you can check out that post to see what we ended up doing for the guest coat dilemma. Here are the before pictures of the front closet. One of the first things I did was find my inspiration photo for the colors of the cloffice on Pinterest. 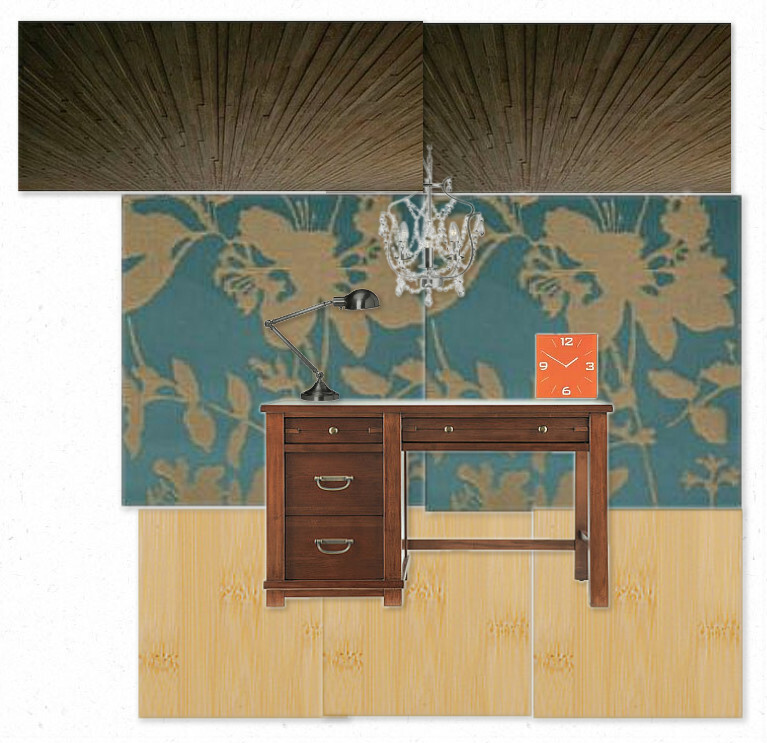 I then tried to create an Olioboard to help me visualize what I wanted. I have not used Olioboard much, as you can tell from the picture below but I will definitely be using it again!
. After I had an idea of what I liked, I needed to find a stencil. There are many choices out there for stencils and you can even make your own which I did in the last cloffice. I was sent a stencil to try out from Wallovers and I chose the Alyma’s Allover stencil. It was hard to choose because I also really loved many stencils, including Decodence. I recently stenciled my powder room with a stencil from Hobby Lobby and it was quite trying. There were little triangles in the corner for lining up the stencil and it worked for the most part but I struggled with it many times. Wallovers uses the repeating patterns in the stencil instead of the little triangles in the corner. You can see the pattern at the top, sides and bottom of the stencil. When you reposition the stencil it lines up nicely and makes it really easy to stencil a wall. Wallovers also sent me the Topper Stencil which made doing the area near the ceiling very easy. Here is the hubby figuring out how the Topper works. The corners are definitely the hardest part of stenciling. I chose to make the main wall the focal point of the cloffice and leave the sidewalls unstenciled. I used a foam roller from Hobby Lobby for rolling on the stencil paint. For the wall color, I used Benjamin Moore Regal Select in Galapagos Turquoise. The BM paint was expensive but I thought well worth the $50 I spent. The paint was thick and rolled on smoothly without splattering. I did two coats but after one coat I was amazed at the coverage. I have tried many different paints but this one is by far my favorite! BM did not pay me or compensate me in anyway for this review, just my personal experience with this paint. For the stencil color I decided to try using the Precious Metals paint in Hazel from the Martha Stewart line at Home Depot. A quart of paint was about $18 and we used less than half to do the wall in the cloffice. I rolled two coats on the stencil before peeling off the stencil and moving it to the next spot. It was hard to wait the few minutes in between coats but I think it looks great and I’m glad I waited instead of rushing ahead. I love the way the wall turned out and would definitely use a Wallovers stencil again! The stencil arrived quickly, was not flimsy and was easy to use! I’m so excited to announce that Wallovers is offering all my readers a 10% discount on any order now through October 31st! So what are you waiting for, head on over and check out their great selection of stencils. Use the code hydrangea when you order and if you have problems let me know. Now for the best part, the after pictures! Some of the pictures are from last night and though I really wanted some natural sunlight, it just wasn’t in the cards for me. The ceiling before hubby installed the light. Here it is with the pendant light. The barn boards on the ceiling came from a barn my friend Jenny & I destroyed ripped apart, you can read more about that here. My sweet hubby did the barn wood ceiling for me. The pendant light on the ceiling is the Kristaller from IKEA. The desk lamp is from the old Cloffice. 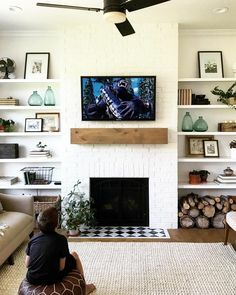 The gold picture frame is from Monica over at Read My Walls. Read My Walls has a new product line that is coming out and it’s adorable. You may have seen frames that look similar in style over at Organic Bloom. Well, the style of the frames is all these two companies have in common. Read My Walls is selling these frames at a fraction of the cost that Organic Bloom sells them at. Plus, Organic Bloom only sells these frames to professional photographers. Well, I am not a pro and you probably aren’t either. Thank you to Monica for allowing anyone to own these stunning frames. Hey, that’s not all…Read My Walls also is giving you the option to buy them unfinished. That means, we can get them EVEN CHEAPER and match them to our home’s own color scheme. What a great option! Last but not LEAST…Monica is giving away one these beautiful frames during the month of October! Who doesn’t like things for FREE? So, hop on over to see what new products Monica is making and watch for the frame giveaway details! The clear file folder holders are from Target along with the file folders and the binder. I am waiting for the pink file folders to come back in at my Target but the blue ones don’t look too bad for now. The letters which represent my blog name are from Michaels and are painted Coral Reef from Sherwin Williams. The white board/cork board combo frame also came from Michaels. The magazine holders are from IKEA. The desk was a CL find on Thursday last week. The original desk did not work out for the cloffice but that’s ok, I think this desk is a great fit and I didn’t have to strip, sand and paint it. The seller’s of the desk gifted me with the chair when they dropped off the desk. I recovered the chair with some fabric I found for $3 at Hancock Fabrics. The chair could use some TLC but I simply ran out of time this weekend. Here’s one more before and after for you. We are still debating if we will up doors on the cloffice but for now, we are going to leave it open. Maybe it will be a good motivator to keep it clean! I am also still on the lookout for some different accessories for the desk and maybe something else for the walls. Stay tuned, this isn’t the last of the cloffice! I hope you’ve enjoyed the tour of my new little space. Now that I’ve shared my closet turned office, it’s time for you to share your closets and nooks! Please link up below. The only thing I ask is that you please put the Roomspiration button in your blog post. It would be great if you stopped at a few other links and met someone new today! Thanks for linking up and stopping by! 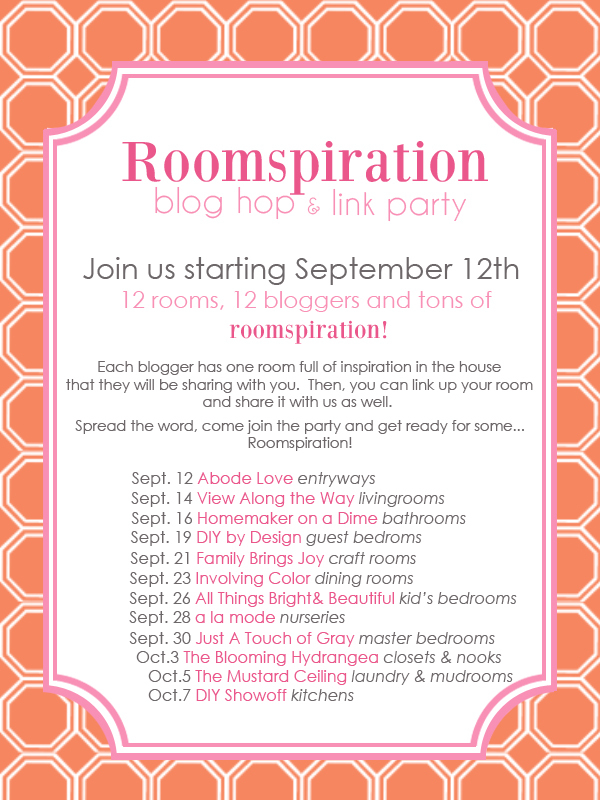 Don’t forget to visit the other great Roomspiration Rooms and it’s not too late to link up, all links will be open until Oct. 14th! Ange! It's stunning! I LOVE the wall color paired with the gold stenciling, that awesome ceiling and beautiful light fixture! (I'm also a big fan of BM paints.) 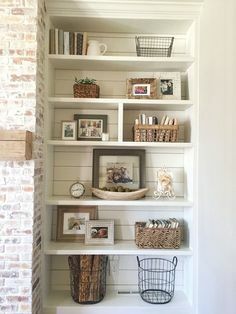 You did an amazing job creating a beautiful work space! Wow!! 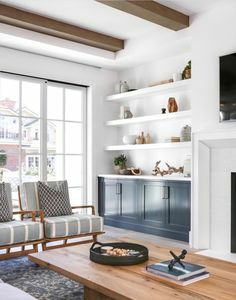 such an awesome space. You did an amazing job on it! I love your wall color and your stencil too! Thank you so much for sharing! I am inspired!! Great cloffice transformation, Ange! I : ) love, love, love, the stenciling! Just linked up my master closet redo (#4) and wanted to say a quick thanks for hosting! P.S. I just went to your Followers box (to follow, of course! ), and it had disappeared. I don't know if this is a common occurrence for you or not, but it seems to be a problem throughout blogland, and I just wanted to let you know that my husband found a fix for it that I blogged about: http://www.fivedaysfiveways.com/2011/09/5-things-thursdays-how-to-fix-your-gfc.html. I really love what you did with the new closet space turning it into a new office! I really love that stencil! 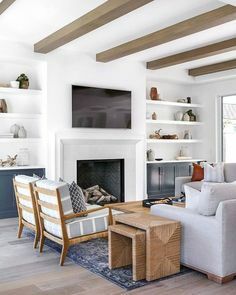 So fun…love the colors and the reclaimed wood ceiling, great job! I love your new cloffice! Wonderful colors and love the blue and gold! Thanks for hosting this linky party. Just linked up and became a follower! Super job, Ange! Love the ceiling too. OK, now I am gonna have to do a ceiling in barn boards. Love the color choices! Looks all fancy! Your stenciled wall is amazing. What a transformation of that space. I LOVE it! And that IKEA chandelier is a great touch. Thanks for hosting the linky party today. Roomspiration has been SO MUCH FUN! Oh. Em. Gee. I LOVE it! Love the stencil, colors, barn wood, chandy – it's all beautiful! Worth the wait to see the final reveal. I absolutely adore your new cloffice! It is beautiful! That is such a gorgeous cloffice. The wall stencil is amazing! The colors and the design. It looks soooo perfect-thanks for the great instructions. You've got me dreaming of stenciling …something…I just don't know what. The ceiling with the chandelier is such a surprising detail-so beautiful. Ange, your cloffice turned out beautiful! The blue and gold stencil looks amazing and I love the chandelier! Your stenciled wall is gorgeous!! I love the background color and the gold! It looks fantastic – thanks for sharing it, and hosting today! 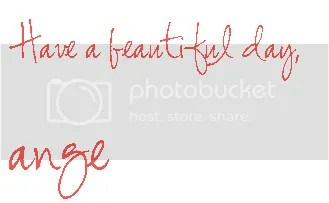 Your cloffice is beautiful! Love the color and the stencil. Oh my goodness Ange! That looks so fabulous! I love the gold stencil over that turquoise color…it looks so glam! 🙂 And all of the little details just make it even more beautiful. Well done my friend! This is awesome! I love it more than your first cloffice. You must leave the doors off, this is too pretty to cover up. WOW! What a gorgeous stenciled wall. I am loving. The gold. And the ceiling. Something that is so often overlooked. Great job. And thanks for hosting. Wow! What a little jewel box of a nook you've created for yourself! That stencil looks fantastic. I would totally think it's wallpaper if you didn't tell me it was a stencil. Great use of space! I'm linking up to your site early in the morning – SO VERY SORRY I didn't get the post up on Monday. Lots of craziness and huge changes going on which I'll be talking about soon. 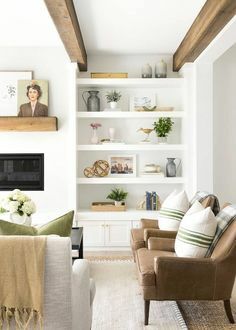 🙂 I hope lots of people click over and check out this gorgeous room you have! 🙂 Thanks for hosting cloffice day! Oh my gosh, Ange!!! No wonder you wanted to do closets & nooks…this is amazing!!! That fabulous stenciling looks so great…and I love that desk, what a perfect little inspirational space! I LOVE your cloffice. First of all that stencil design is gorgeous. I love the color scheme and I would want to work in there. I have a home office, but a cloffice seems so cool. It reminds me of when I was a kid and I turned my a closet in our basement into my "office". That's where I set up a chart on the wall with the keyboard and on an old typewriter everyday I would teach myself how to type. I don't know what possessed me to do that at ten years old but I did. Awesome inspiration!! FABULOUS! Just amazing! That wall is. to. die. for. Well done, Ange, well done! Stunning stencil work in metallic paint and great color choices..it makes an impact. Love the chandelier and the ceiling too. Beautiful! oh my goodness!!! This is LOVELY! And the chandelier is perfect. Great job! This is truly an inspirational closet turned office. Based on the before and after photos, there is a great difference indeed. The cloffice sure looks expensive! Being in the closets Bergen line of business, this looks like a project that is well done! Hi there – I stumbled across your blog and love it. I’m working on my own cloffice and actually may buy that exact same IKEA chair. Does it fit when the door is closed? Do you mind me asking how deep your closet is, and how high the desktop is? Again – beautiful website. I’m so inspired!